The earliest mention of Waldeck dates back to 1120 as the home of the counts of Waldeck. Around 1500, various wings were added, increasing the castle’s size and stature in the region. Waldeck came under siege in 1760 during the Seven Years’ War, and sections of the castle were heavily damaged. The castle served for a time as a prison until abandoned. It has operated as a hotel since 1905. Schloss Waldeck can be a busy enterprise at times. During the day, many day trippers come to visit the museum, and on weekends weddings can be quite the events. The stunning location of the castle above the lake makes Waldeck worthy of a visit. If you do stay the night, opt for one of the rooms inside the old castle instead of the annex. Ask, too, about any special activities the castle is offering during your visit. Often there are torchlight tours of the medieval castle kitchens, fireworks displays, and special excursions around the area. Waldeck is approximately 40 km southwest of Kassel, along the eastern shore of the Edersee. You’ll need a car to get there. The castle offers everything: arrangement for civil magistrate to come, carriage, music, fireworks, and costumes. Perched high on a rock above the Edersee, the mighty fortress of Waldeck makes quite an impression upon approach. A steep cobblestone road passes through the walls and the narrow archways. Park the car and enter the stone walled front lobby. 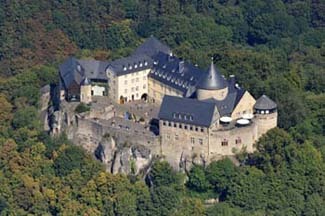 Unlike most other German castle hotels, the atmosphere is more modern in approach. However, enough castle-like decorations and the architecture itself will remind you that you’re in the real thing. Most of the castle is given over to a museum. Guest rooms are contemporary in style in the castle and the annex. The best rooms to opt for are in the old castle. A couple of restaurants offer different dining options from romantic candlelight dinners to the occasional medieval banquet, prepared according to original recipes.